Mon stylo blanc va avec ma jupe blanche. My white pen goes with my white skirt. Un sourire franc est le signe d'une personne franche. A frank smile is the sign of a frank person. Dans un jardin public, je vois une ovation publique. In a public garden, I see a public ovation. Je connais un homme turc et une femme turque. I know a Turkish man and a Turkish woman. Notice that adjectives ending in -c usually become -che in the feminine form, when the -c is mute in the masculine form. If we hear the -c in the masculine, then it usually becomes -que in the feminine form, to keep the pronunciation. In the case of grec (Greek), you actually keep the c and add que : grecque. Je mange un yaourt grec dans une maison grecque. I eat a Greek yogurt in a Greek house. ATTENTION: for each rule its exception! 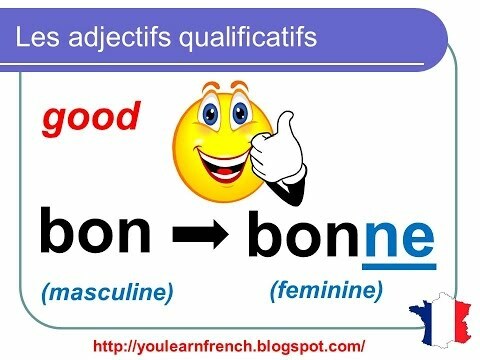 Here it's sec (dry), you hear the 'c' in the masculine form, and yet its feminine is sèche. Mon manteau est sec mais ma serviette n'est pas sèche. My coat is dry but my towel is not dry.